“Hi… I just wanted to let you know we don’t have the salmon, the mussels or the ribs tonight,” our waiter informed us as we sat down. We nodded and were unconcerned as we were there to get their fried chicken dinner, but I was shocked that they were out of 3 entrees when it was 5:30pm, the start of the dinner service. WHAT? Out of biscuits at 5:30pm? WTF?! You aren’t out of biscuits – your lazy chef hasn’t bothered making them. We should have left, but we nodded again and resigned ourselves to inferior cornbread. 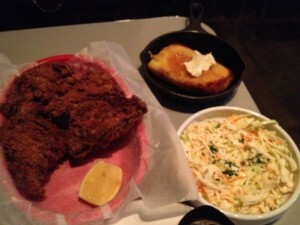 The chicken was over fried – one shade darker and it would have been burnt. The interior was moist, but I did not detect any of the sweet tea brine. The skin was crispy, but detached from the meat at first bite. The slaw was swimming in mayo and might have come from a large Sysco tub. The aforementioned cornbread was Yankee style (sweet and cakey) and served seared in a cast iron pan. It would have been good, if the bottom was not completely blackened. 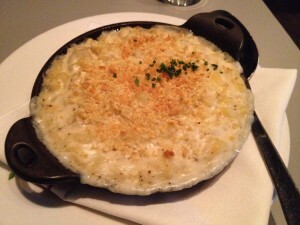 The mac & cheese came hot and bubbling in a cast iron casserole, topped with buttered bread crumbs. The sauce was creamy and well-seasoned and the topping added a much needed contrast to the soft pasta. Our service was fine (other than informing us about all the missing menu items). The prices are high for the food. Sorry, Boston Magazine, this is not a destination.